Winter squash are different from summer squash because a gardener plants them in late spring for harvest in the fall. 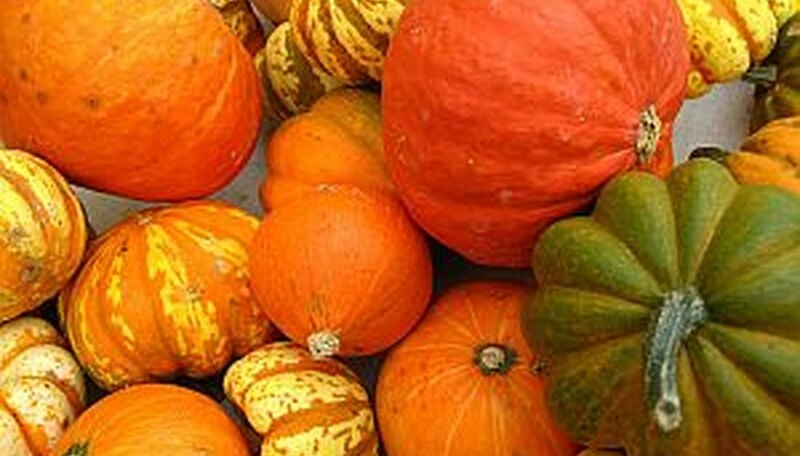 The most popular winter squash varieties include acorn, butternut, spaghetti and pumpkin. Careful attention to proper harvesting and curing techniques will ensure a delicious winter squash harvest that will store successfully over the winter season. Gardeners growing winter squash should have a tasty variety from which to choose for savory winter meals. Tend the winter squash vines carefully during the growing season. Remove weeds as they appear around the squash plants. Provide one deep watering every week if sufficient rain does not fall. Harvest winter squash in the autumn when the vines begin to decline and before autumn frosts occur. Mature winter squash vegetables are heavy and hard. Press your thumbnail into the outer rind and if the rind does not give to the pressure of your nail, the squash is mature. The outside rinds of mature winter squash will be deep, glossy colors. Cut the squash from the vines leaving a 2-inch stem on each squash. After cutting the squash, leave them laying on the soil for approximately one week to cure. If it rains or temperatures fall below 50 degrees Fahrenheit during this curing period, move the squash inside to finish curing (a warm greenhouse would be an ideal curing location). Inspect the winter squash after curing and discard any that show signs of insect infestation or decay. Store the winter squash at constant temperatures between 55 and 60 degrees Fahrenheit. The ideal humidity level for long-term winter squash storage is between 50 and 70 percent. Store winter squash in this environment for up to 3 months. Check the condition of the winter squash periodically during storage and discard any vegetables that show signs of decay. Handle the winter squash carefully because they are fragile. Bruising or puncturing the outer rinds may lead to decay or insect infestation. Temperatures below 50 degrees Fahrenheit may injure winter squash still in the field.